There is a song by Sparks called Talent Is an Asset. 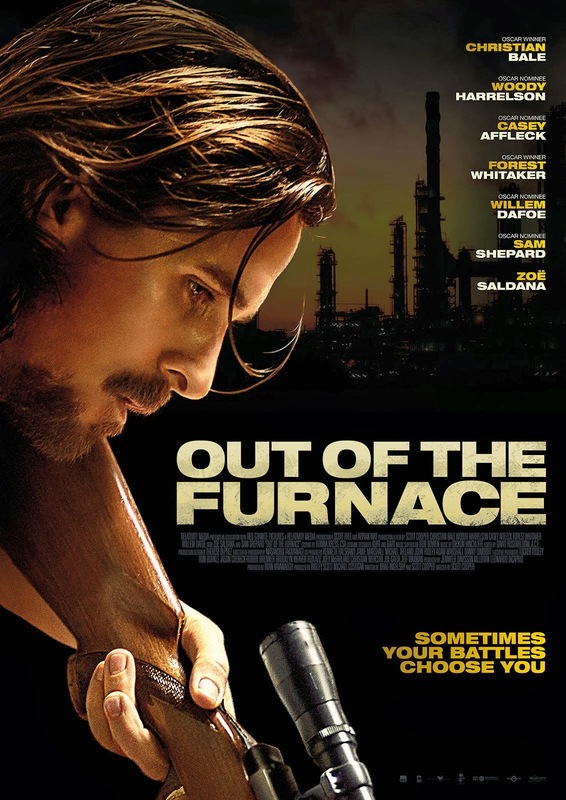 It’s a turn of a phrase to remember when watching Out of the Furnace, the second feature by Scott Cooper, because without its very talented cast, the movie would not be as good as it is, and it wouldn’t be as persuasive. Cooper has taken a spec script by Brad Inglesby (who receives a co-writing credit) – and which originally had Leonardo DiCaprio and Ridley Scott attached to it – and made a movie that alternately baffles and convinces with its plotting. It’s a movie that takes over half its running time to get to the meat of the story, and which throws in a couple of sub-plots for good measure in order to pad out said running time. It’s a tale that begins inauspiciously, in the small town of Braddock, with steel mill worker Russell Baze (Bale) discovering that his younger brother, Iraq War veteran Rodney (Affleck), is in serious debt to local bar owner and small town criminal John Petty (Dafoe). Without telling Rodney, Russell begins paying off his debt, but an unexpected and tragic accident sees Russell sent to prison. In the meantime, Rodney returns to Iraq for another tour of duty, their terminally ill father dies, and Russell’s girlfriend, Lena (Saldana), takes up with the town sheriff, Wesley Barnes (Whitaker) without even telling him. When he eventually gets out, he soon discovers that Rodney, who is now back home for good, is taking part in illegal bare knuckle fights in order to pay off his debt to Petty. Russell challenges him to work at the steel mill instead but Rodney refuses. Out of the Furnace has two clear ambitions: to be a tough, uncompromising drama, and to provide a snapshot of rural communities along the Eastern Seaboard of America, and their daily struggles to keep their heads above water. 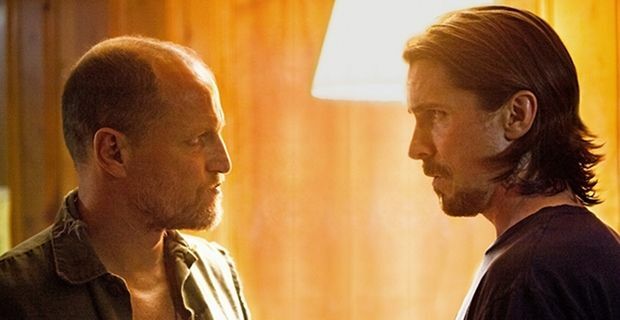 For the most part, Cooper succeeds in making the movie tough and uncompromising, and there are several scenes that exert a morbid fascination in terms of the characters and their acceptance of the way Life makes their situations worse than they need to be. Rodney can’t see a better way out of his financial situation, and so gets regularly beaten and bruised and bloodied. Russell comes out of prison and makes only a half-hearted attempt to reconnect with Lena (an attempt that is shot down in flames in moments). And Lena rues the decision she made in leaving Russell but is in a position where she can’t back out anymore. All this makes everyone’s life that much harder, and their various predicaments are what drive the movie forward. And then Russell finds himself in another corner, the one where he feels compelled to seek revenge for what’s happened to his brother. Decisions and consequences, then, but ones that aren’t handled that well by Cooper, and ones that follow a very prescribed pattern. A scene showing DeGroat making and injecting heroin is interspersed with shots of a SWAT team advancing on the house where DeGroat is supposed to live. Not one viewer should be surprised when the SWAT raid reveals DeGroat isn’t home and that he’s somewhere else. This scene and others play out as if we’ve never seen them before, and while familiarity can be used to a director’s advantage, here they’re just stepping stones on a path too many of us have witnessed before. Cooper also connects the dots for the viewer at almost every turn, and there’s too much unnecessary exposition propping up these scenes to make them anywhere near effective. As for the backdrop of the town’s misfortune, aside from a brief mention that the mill is expected to close, the precarious nature of people’s lives and the decline of Braddock’s infrastructure is glimpsed but receives no further exploration.